All chain users should have a chain breaker. Although the chain on your chainsaw is sturdy enough to endure many hours of cutting massive tree limbs as well as several sharpening over a couple of years, there will come a time when you’ll have to replace it. To install a new chain on your cutting tool, you’ll have to remove the old chain first, right? For some chains, they come with a removable master link that allows easy removal. For others, you have to use a tool known as chain breaker to break the link effectively and remove the chain. What Exactly is a Chain Breaker? It’s a necessary tool that holds as much importance as the guide bar wrench or primary screwdriver. Also known as a splitter, this handy tool acts as a one-two chainsaw reinstalling and repairing combo! The breaker can effortlessly break the toughest f the chains using its long lever. It comes with multiple anvils that enable it to accommodate chains of all sizes. The tool also comes with heavy-duty steel base plate which you can easily mount to the work bench. Long lever action handles that helps break even the toughest chainsaw chains. Fast, effortless spinning of the rivets (with built-in thrust bearing for the low friction). It also comes with chain guides that are height-adjustable for simplified centering. Robust steel base with mounting holes. Before you start using your chain breaker, it’s recommended that you tart by familiarizing yourself with the different parts it comes with as well as how to use it. This will help you use it to remove the worn out chain correctly, without causing any damages to the guide bar or other parts of your chainsaw. To start using this tool, you need to start by bench-mounting it. For a successful bench-mounting, pick an appropriate workbench- it must be stable, secure, and level to adequately support the tool weight, work material, and the pressure applied to it when breaking the chain or rivet spinning. Refer to your user manual for detailed instruction on how to bench-mount your chain breaker.The tool is intended for two main tasks namely breaking apart the chain, and reassembling the chain. In any case, it’s important that you wear protective gear- safety goggles, leather gloves, etc.- if you mind your safety. You would also want to keep your hands off the breaker punch, spinner die, spinner sleeve, and the thrust die when operating the tool. Otherwise, you might experience severe pinch hazards in these areas. Set your chain to the correct notch on the breaker anvil. Ensure that the rivet lines correctly lines up with the hole in the base of slot present in the anvil. Place the anvil as well as the chain directly under the breaker punch. Lower the lever so that it lowers the punch onto the rivet. Ensure the rivet is centered on the rivet, and the rivet is centered on the hole at the base of the anvil. Pull down the lever so as to drive the rivet out of your chain. If the rivet binds, recheck alignment of all the parts. Apply some penetrating oil; try to push the rivet out of the chain again. When the rivet has come out successfully, remove your chain from the anvil and check to see if there are any link damages. Choose between the small or large thrust dies and spinners and insert them into the thrust handle and the spinner sleeve respectively (use a matched set of dies at all times; avoid mixing sizes). Apply some grease to the rivet and insert it into place- assembling the chain loosely. Now drape your chain over guide wheels. This enables you to hold it into the right position for efficient spinning. You can also adjust the wheels positions using the wheel locking fasteners. Make sure the rivet is centered on dies). Rotate the thrust handle in a clockwise direction until your chain rivet appears against the spinner die. Double check to ensure the rivet, chain links openings, and the dies are properly lined up. Apply some oil to the dies’ faces. Turn the spinner handle in a clockwise motion to start forming a rivet head. Meanwhile, turn the thrust handle slowly to ensure the rivet remains centered and to offer substantial resistance to any pressure delivered by spinner die. When the rivet head has been formed, release the chain by turning the thrust and spinner handles counterclockwise. Finally, check the rivet to ensure it is properly developed. Also, check the chain to ensure it moves freely and is not damaged. 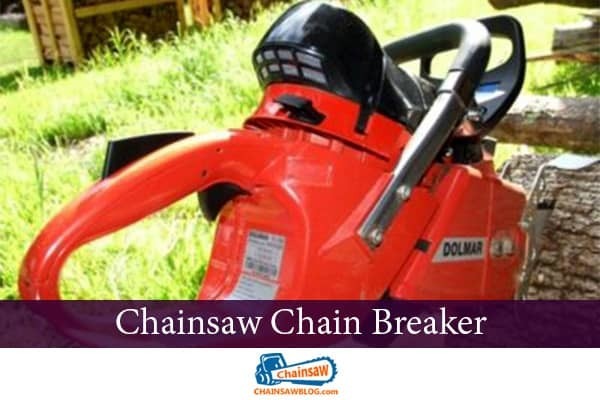 A chain breaker is a useful tool that every chainsaw user ought to have. It helps you break as well as reinstall your chainsaw chain quickly and effortlessly. When using this tool, however, you’ve protective gear on. After use, clean all its surfaces with clean, moist fabric. And remember to store it in a dry location to keep off corrosion cases.